Shadow Finance Minister Irfaan Ali has recommended that the Government of Guyana immediately take steps to reengage the Government of Venezuela in a bid to regain market for rice that was ceased by Venezuela some months ago. 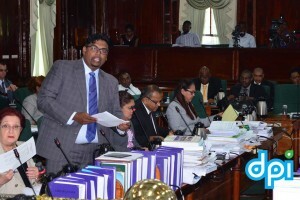 Ali made the recommendation while debating a motion on the current state of Guyana’s rice industry. The recommendation to re-engage the Venezuelan Government was one of several out before the House by Ali. “Mr Speaker, it is discernable that the relationship between this government and the Government of Guyana did not start off on the right footing. Mr Speaker, I will adumbrate the social and economic reasons why the Government should resume talks with Venezuela on the exportation of rice and paddy to this country,” said Ali. He noted that failure on the part of the Administration to act in this regard the effects will be far reaching and detrimental to Guyana’s economy. Others included tax breaks and fuel, water and electrical subsidies. In July 2015, news broke that Guyana will no longer be exporting large quantities of rice to Venezuela, sending a wave of concern throughout the rice industry as the collapse signals a certain downturn for the sector, given the fact that rice farmers are fully dependent on the Venezuelan market to export their produce. Under the scrapped trade agreement, Guyana is expected to supply 210,000 tons of paddy and polished rice annually to Venezuela. The value of this supply amounts to US$130 million. It is understood that Venezuela has ceased all forms of trading with Guyana.